WOMEN in West New Britain Province will now be able to access loans to venture into small businesses. Their future has been assured through their Governor Sasindran Muthuvel who said that the government would give K110,000 as seed capital with K10,000 each for the 11 local level government areas. The money would be deposited into the National Development Bank (NDB). Mr Muthuvel said this would assist the women to go into income generating activities . He said this was one of his government’s key priority areas to self-empower the people particularly those in the rural areas. He made this revelation during the launch of the West New Britain Women in Fisheries Association last week. The governor said that the Provincial Administrator Steven Raphael would work out the details with NDB Manager Paul Viritia for the loan initiative. The seed capital arrangement with the NDB has proved successful in East New Britain and East Sepik provinces. Mr Muthuvel also committed K10,000 from his discretionary funds to assist women into fishing projects which has greatly boosted the women’s business morale. West New Britain Province. 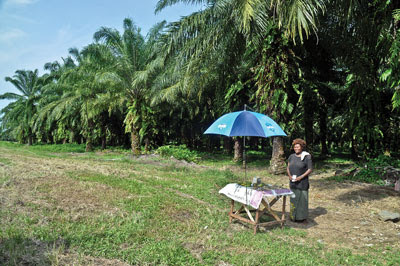 Behind her are oil palm trees plantation. The women led by the provincial government fisheries officer Dorcas Kubaki had formed women groups in the various local level government areas and now have launched the Provincial Women in Fisheries Association. Another bonus for the Women in Fisheries Group is that two of their members would be among the first five people to travel to India next year to attend the Bare Foot College for six months. Mr Muthuvel said the Indian High Commissioner has given approval for five people to attend the Bare Foot College. There they will be taught life skills in rural technology such as rural electrification, water supply and solar power. Meanwhile, Mr Raphael said that the Moramora Technical High School would also be upgraded to cater for fisheries training. He said the provincial government entered a partnership with Coastal Fisheries Agency to build the Fisheries Training facilities. He said the provincial government has committed K100,000 for the project while Coastal Fisheries Agency would provide another K100,000.